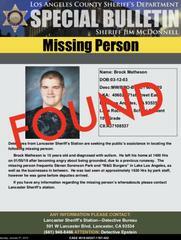 **UPDATE FOUND** Critical Missing Teen, Brock Matheson, MW/15 last seen in Lake LA. Diagnosed with Autism & mental capacity of child. Lancaster Station detectives need your help locating Brock Matheson. Brock is a 15 year old, white male, diagnosed with Autism and a mental capacity of a child. He is about 6’3” and weighs 220 lbs. He has brown hair and blue eyes. He was last seen earlier today at 4:30pm at Sorensen Park in Lake LA and frequents the park, “M&G Burgers” and other nearby businesses. With the cold weather and rain upon us, we need your help locating Brock right away. If you see anyone matching his description, please call our station at (661) 948-8466.